Premarital Couples: Is There a “Best” Age To Get Married? Does How Old You Are When You Marry Matter? We do a lot of premarital counseling at Growing Self, and so I’m always interested in sharing information about all matters related to creating a happy marriage, and a lifetime of love. I recently had the privilege of speaking with Kristen Skovira of Denver 7 about a topic that I find fascinating: Recent research suggesting that there is an “ideal age” to get married — and lower your chance of divorce. I thought I’d share the highlights of our interview with you. 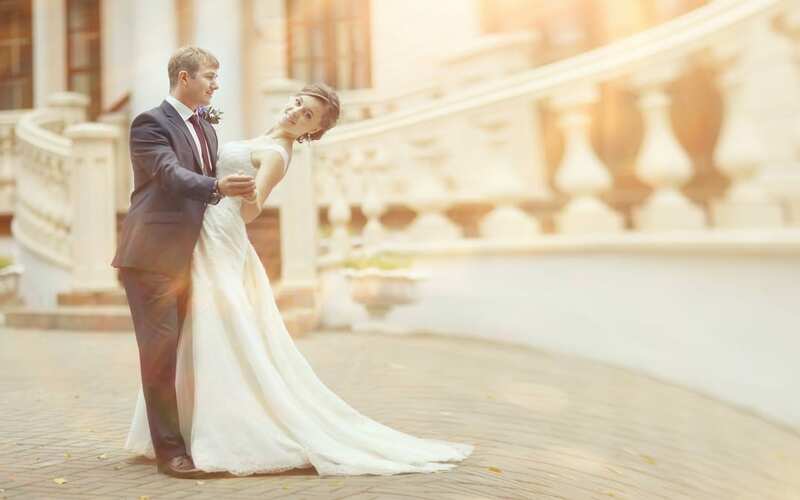 Nicholas H. Wolfinger, a sociologist at the University of Utah, has compiled data in family research which suggests that there is in fact a “sweet spot” for getting married. People who get married between the ages of 27 to about 31 have a lower likely-hood of divorcing than younger couples, OR couples who marry in their later thirties and forties. 1) Couples who marry in their late twenties may have personality factors and life circumstances that support happy marriages. There is lots of research documenting factors that support successful marriages. These include higher levels of education, higher socio-economic status, as well as personal factors such as strong commitment, values around marriage and family, responsibility, and conscientiousness. People who get married in their late twenties have given themselves time to get through college and / or graduate school, and get established in a career — evidence of personal responsibility and conscientiousness. However, they have also prioritized finding a mate, and cultivating a relationship. (As opposed to spending six years hiking through Eurasia, messing around in the Peace Corps, or spending 80 hours a week clawing themselves up some corporate ladder). Their life decisions may reflect their core values, which is “marriage and family is very important to me.” Having that core value may help sustain their commitment to the inevitable ups and downs of marriage during years to come, as well as seek out support that will help them nourish their relationship during hard times. In contrast, people who delay marriage until later life may not have the same priorities around marriage and family. 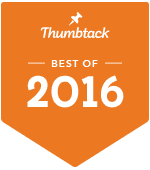 (Although many older adults absolutely do — they just haven’t found the one yet). 2) People who marry later may be carrying “relationship baggage” into their new marriages. Furthermore, all of us usually learn how to “do relationships” from our families of origin. The fact is that people in their 30’s and 40’s are children of the 70’s and 80’s — decades when divorce rates were at an all-time high. Many Gen Xers and Gen Yers often did not have good models for how to repair and nourish healthy, happy marriages. Their parents chucked it when it got hard, and chose to look elsewhere for their happiness. People who did not have good role models in the relationship department often need to get some guidance on “How To Do Relationships” — particularly if repeated relationship disappointments suggest that they may have room for improvement. Without using failed relationships as an opportunity for learning and growth, they’re likely to repeat negative patterns in new ones. 3) Blended family situations are very difficult. The info-graphic we’re discussing is specific to first-time marriages. But I feel that it would be irresponsible for me to not touch upon a major factor impacting people who marry when they are older: Blended family situations. Many older couples-with-kids (even those who love each other very much, and are extremely excited about getting married to each other) are absolutely shocked by how difficult negotiating blended families can be. The higher divorce rates for second and third marriages reflect the grim reality: Blended families are uniquely challenging. There are many reasons why blended families and step-families are hard. Most couples attempting step-parenting require support and guidance as they work through the turbulent first years of creating new family roles, figuring out boundaries with each other’s kids, and supporting each other as parents — while establishing a strong marriage. It can be emotionally harrowing. Couples who successfully establish happy blended families do so through a great deal of intentional effort. I believe that statistics on divorce rates for older couples reflect the challenge that many blended families face. But here’s the truth — MOST couples have lovely, happy marriages no matter what age they marry. 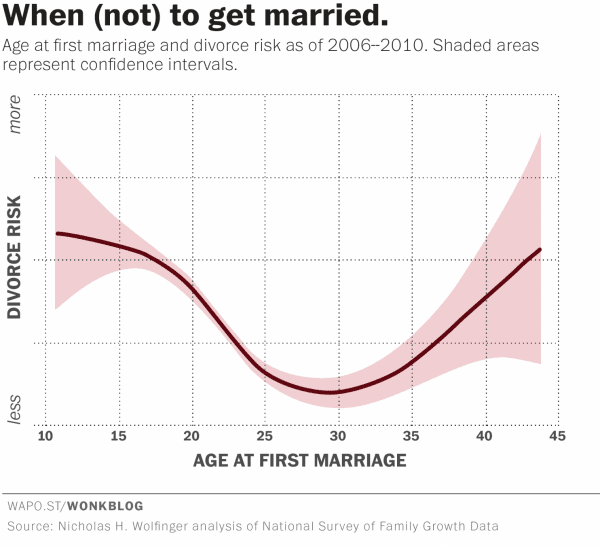 Divorce rates are falling, and half of what they were at their peak in the 1980s. Furthermore, statistics don’t account for personal factors. I personally have been with my husband since I was nineteen years old, and got married when I was twenty-two. According to this nifty chart, I should have gotten divorced a long time ago. Twenty years on, we’re happier than ever. One way to ensure that you have a happy, satisfying, and secure marriage — no matter what age you are — is to get involved in high quality premarital counseling before you get married. Premarital counseling allows you to get on the same page going in to your marriage, and to solve potential problems before they even become a thing. It’s the responsible thing to do.